Is Wachovia Login Form Usable? Wachovia.com recently updated the design of their homepage. With redesigns, I usually would give it a try for a week or two before putting the final verdict. After all, I’m a designer myself and 100% aware that people generally hate change. However, there is something about this new login form that makes me stop and think before proceeding with what I have to do. In web design, breaking user’s flow is generally a bad thing. A very bad thing. 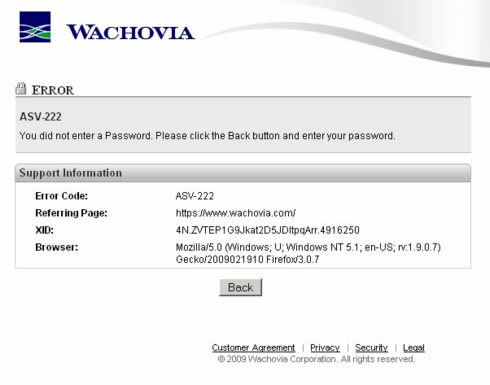 I’ve been a Wachovia customer for over 5 years now, and never had trouble using the site. I use the site for mostly online banking (checking my balance, transfer money, pay bills, etc. ), so being able to login easily is an important aspect for me as a user. In order to garner a good user experience, login forms should be kept simple and straight-forward. Username/email field should be presented first, followed next by a password field, and finally a submit button. Optionally you would have the “Remember Me” box, usually placed before the submit button. You’ve seen this form many times in many different sites. This is where things get confusing for wachovia.com. Instead of the usual approach, their login form is organized the following way: username field, “Remember Me” box, password field, and submit button. Nothing too earth-shattering at first, but let’s try using it. You start at the username field (the site is nice enough to focus your cursor in this first field). After typing that in, the majority of user would press TAB to go to the next field. Usually this next field is a password field, but it really is a “Remember my User ID” box. Then you press the “Back” button (or the Back button on your browser), but now the form has completely stopped working (pressing the submit button or Enter will not submit the form) – until you close your tab and visits the site again. I wonder how many people have done this same exact thing. 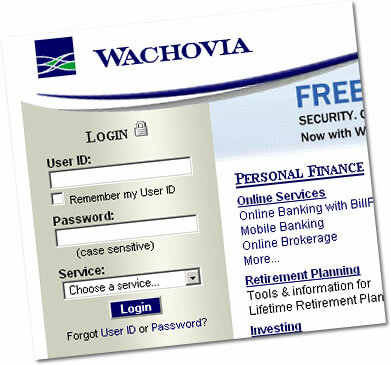 With Wachovia.com new redesign, one of their focus was to “make the online account system as user-friendly, more efficient, and customizable.” They were aware that 79.3% of customers use the site primarily for online account management. So why make it harder? This whole thing can be avoided simply by keeping the old log in form. After the 100th time of being placed in that error page, eventually I will probably learn to press TAB twice to enter my password. After all, isn’t it a goal of every web designer to make their design obvious? Have you had trouble with Wachovia.com or similar experience with badly-designed login forms? How around Partials, by Dan Wells?